The Cressman Center for Visual Arts is pleased to announce donnottellmewhereibelong: drawings and sculpture by Joan Tanner. Over a prolific career, compelled by a "curiosity to engage contradiction" and an impulse to disrupt "assumptions about spatial relations," Joan Tanner's art has developed across disciplines to encompasses many media, including painting, photography, video, sculpture, assemblage and installation. 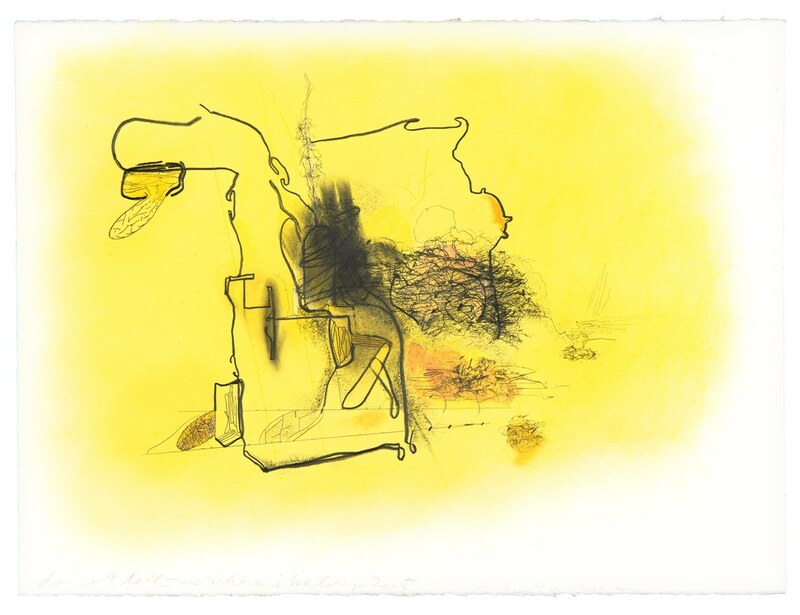 donottellmewhereibelong is an exhibition that surveys a selection of Tanner's drawings and three-dimensional works from the past twenty years and reveals an artist fascinated with ideas of history, impermanence, and inconsistency. Throughout her career, Joan Tanner has grounded her practice in the activity of drawing, at times using it to test design ideas that will be realized elsewhere in her work, but mainly as a self-directing medium to explore "Thought Forms"—to help grasp and clarify her creative ideas and emotional experiences. Returning continually to drawing, as with her other activities, Tanner allows the medium and its restrictions to direct her initial concepts and impulses, as if liberating her predeterminations through the very process of making. In recent years she has devoted much of her time to drawing and this has resulted in a body of ongoing works that reveal anew her fascination with organic, scientific, and architectural forms. Tanner began her career in the 1960s as a painter, and since then her interests have grown to embrace a wide range of media and materials. For her, meaning is variable, dependent upon place, time, and the viewer, a contingency that is made all the more complex by the way she recycles and reshapes the elements that make up her sculptures. For instance, as evidenced by the date range for her sculpture, Screen Hat (1990-2010), Tanner has been reworking this small object for two decades. Employing often disparate elements, the four sculptures in this show pursue Tanner's stated interest "in spatial discord and reconfiguration by way of stacking, bundling, sequence and chanced movement." By her own admission, Tanner's ideas evolve through chance as she becomes absorbed in their invention, so that the outcome is not necessarily the ending she had in mind. This is not, however, a vague or unintentional activity but one that shifts restlessly between seemingly contradictory forms and methods. Bringing about both visual connectivities and their disjunctions, flux can be seen as a principle that underscores and unifies Tanner's work, even as her drawings, sculptures, and installations make visible the fissures and breaks that exist in any unifying theory. Through an aesthetic of "unfinishedness," Tanner underlines the fact that our world is governed by impermanence and change. Born in 1935 in Indianapolis, Joan Tanner has lived in Southern California since the mid-1960s. She has consistently exhibited her work since 1968 and has held solo exhibitions at Santa Barbara Museum of Art; MCA Santa Barbara (formerly CAF); the Ben Maltz Gallery at Otis College, Los Angeles; and Suyama Space in Seattle; and the Speed Art Museum here in Louisville, Kentucky. Among others, Tanner's work is held in the following public collections: The Getty Center for the History of Art and the Humanities; Harvard University; Stanford University; Hilliard University Art Museum; The Speed Art Museum; Santa Barbara Museum of Art; and Weatherspoon Art Museum. Over the years, she has been a visiting lecturer at the University of California Santa Barbara, Ohio University in Athens, Illinois State University at Normal, and the University of North Carolina at Greensboro. Tanner has been a visiting lecturer at the University of California Santa Barbara, Ohio University in Athens, and Illinois State University at Normal, and the University of North Carolina at Greensboro. Julien Robson is an independent curator with more than thirty years of international experience. From 2000 to 2008, he served as Curator of Contemporary Art at the Speed Art Museum, as well as the Curator of Contemporary Art at the Pennsylvania Academy of the Fine Arts from 2008 to 2012. Presently Robson directs the Great Meadows Foundation and the INhouse Foundation, and is the curator of the Shands Collection, and the Brook Smith Collection.